Today, the Head of the Embassy and Permanent Mission of the Islamic Republic of Afghanistan and Permanent/Resident Representative to the United Nations and other International and Regional Organizations in Vienna, H.E. Ambassador Khojesta Fana Ebrahimkhel paid a visit to the OSCE Academy in Bishkek, within the framework of her official visit to Kyrgyzstan. Ms. Indira Satarkulova, the Academy’s Deputy Director, introduced the Academy’s main goals, programmes and activities. 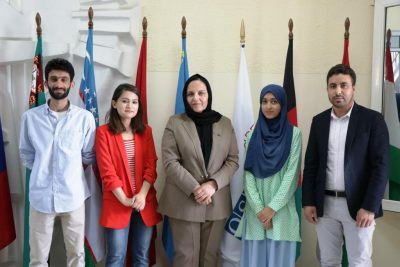 Madam Ambassador expressed a great interest in the Academy’s activities and highlighted the importance of the OSCE Academy for the region and Afghanistan in particular. The introduction was followed by the meeting with current students and alumni from Afghanistan. The OSCE Academy has accepted students from Afghanistan since 2008. The total number of Afghan alumni reached 45. Currently, there are 10 students enrolled in both MA Programmes and 12 more students are accepted for the next academic year.